I know what you’re thinking; it’s easier to just take your shoes to the shoe repair guy. However, there are a few reasons this may not be possible. There might not be a shoe repair place in your area (as is the case in my hometown), you may not want to spend money on such an easy repair (you’ll see), or you may be really broke. Other people might also be tempted to think, “why not just buy new shoes?” First off, if your reason is “broke,” new shoes may not be in question. Secondly, I personally hate waste. I’ll toss, repurpose, or donate something when I really don’t like it anymore, or when it’s beyond repair, but otherwise I’ll try to fix it. Also, I don’t actually need shoes (I’m the last person who needs shoes…I have about 50 pairs, no joke), so it’s not a question of replacing something out of need really….sometimes I just like that pair, so fixing them is the better option. (Broken shoes…I also bleached the white parts when I was done). (It’s slightly hard to see it in this pic, but it’s the best I could get, as the glue is transparent. Basically, you want to spread a fairly even layer of glue all along the area. Good luck! 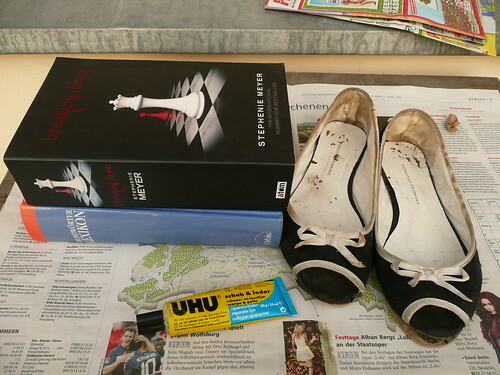 You can also use shoe glue to stick accents and stuff back on, or to jazz up a tired-looking pair of shoes (you could try gluing on flowers or rhinestones, for example). 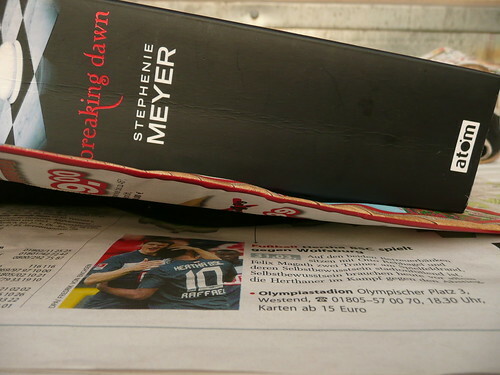 *Breaking Dawn also makes a great paperweight, and it’s handy for weighing down fabric while I’m cutting out patterns! Great DIY! Besides, those classic flats are too cute to toss. Bet they look great with white brought back to life. Thanks! Yeah, they go with everything as well…couldn’t throw them out!